I saw a live Lear's Macaw for the first time when I visited the collection of Nelson Kawall with Joe Cuddy in July 1991. It was a female and I was immediately enchanted by her. Being familiar with the larger Hyacinthine Macaw I could well understand why it was at first thought in the 18th and early 19th centuries it was a female of the latter species with its smaller daintier build and less intense blue plumage. Indeed Latham gave 28 inches as the overall length in describing the Hyacinthine Macaw for the first time in his famous work Index Ornithologicus published in 1790. Although the illustration in the work is undoubtedly a Hyacinthine Macaw he may have measured a carcass of a Lear's Macaw in the belief it was a Hyacinthine Macaw to arrive at this statistic. The woodcut engraving at the beginning of the entry on the Hyacinthine Macaw in the work entitled The Gardens and Menagerie of the Zoological Society delineated commissioned and published by the Zoological Society of London in 1831 features two macaws with what appear to be triangular bare patches to the face. Then Edward Lear produced his famous illustration also entitled "Hyacinthine Macaw" around the same time, which was identified and described as a new species by Prince Charles Lucien Bonaparte, nephew of the Emperor Napoleon, some 25 years later in 1856. He accorded it the name Anodorhynchus leari in honour of the famous illustrator. Lear's Macaws appeared in the bird trade occasionally throughout the 19th and early 20th century, but no-one in Europe knew where they came from. As late as 1973 Joe Forshaw was writing " Exact range unknown, but probably north-eastern Brazil in the states of Pernambuco and Bahia." in the first edition of "Parrots of the World". However, at the end of 1978 Helmut Sick, the famous German-born Brazilian naturalised ornithologist discovered a population of Lear's Macaws in northern Bahia in the Raso da Caterina area near the town of Canudos and Forshaw was able to incorporate this new exciting information in the 1981 revision to the second edition published in 1978. 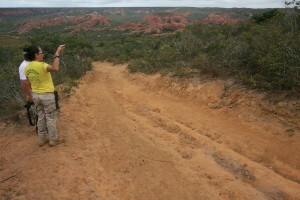 Although field-workers such as Carlos Yamashita studied the population at intervals during the 1980s and early 1990s, it was not until a few years ago that in-depth investigation of the species began with the establishing of a research station near its roosting and nesting locations in the sandstone cliffs of the Raso da Caterina. During my last visit in January 1999 the project team was analysing the data they had collected over the previous two years to arrive at proposals for the conservation of the species. This had become urgent as trapping activity had increased dramatically and macaws were starting to appear in the illegal trade in larger numbers. Officially there were only two Lear's Macaws held in captivity outside Brazil and these were two females bred at Busch Gardens in the mid-1980s. Two have been confiscated in Singapore, three in the UK - the subject of a very recent trial - and six or seven are known to have gone to a collection in the Middle East via Russia and the Czech Republic. Nine macaws were discovered at a breeder's location in the western Brazilian state of Rodonia whilst I was in the Pantanal in January 1998 and are now being held temporarily in Sao Paulo Zoo. It was as a result of this increased illegal activity that IBAMA, the Brazilian government environmental agency, issued a press release world-wide in July 1998. This condemned the illegal trafficking and pledged to recover and repatriate any macaws discovered anywhere in the world. Last November (1999) IBAMA produced a booklet in conjunction with UVPack, a Brazilian packaging company based in Sao Paulo, whose Technical Director, Ninian Richardson, an English expatriate, is actively supporting conservation measures. This 24 page A5 booklet briefly describes the three Anodorhynchus macaws (hyacinthinus, lear's and glaucous) and the Spix's Macaw (Cyanopsitta spixii) before going into greater detail on the Lear's Macaw using the important findings of the field team. The information is ordered into sections headed "Habitat", "Feeding", "The licuri palm tree", "Feeding areas", "Breeding areas", "Populations", "Captivity" and "Habitat destruction". It then examines "Problems and solutions for the preservation of the Lear's Macaw" before describing 6 sub-projects. These include 1) monthly census of the populations, 2) definition of the area used by the Lear's Macaw and monitoring of daily and seasonal movements, 3) full time monitoring of the nests during the breeding season, 4) study of the licuri groves 5) maintenance of the licuri palm tree pilot project and 6) measures to prevent illegal trapping. The species exists exclusively in Bahia throughout the municipalities of Canudos, Euclides da Cunha and Jeremoabo. 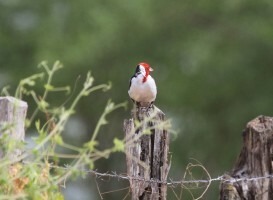 More recently it has been reported that this bird can also be found in the municipalities of Sento Se and Campo Formoso. This is an area dominated by flat top mountains with altitudes of 380 to 800 metres, where one can find canyons and sandstone cliffs eroded by streams. The natural landscape is "caatinga", a short bushy and thorny vegetation characterised by a dry warm climate with irregular rain fall. This is certainly an important factor in the growth of the vegetation. Rain can be totally absent for many months, or even years, and is poorly distributed. 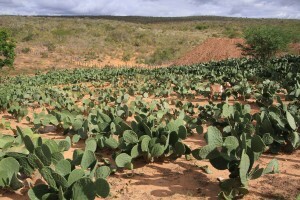 Although the soil is fertile in many areas the "caatinga" predominates, and includes species well adapted to lack of water such as the cactus. When it rains the "caatinga" (white bush in the language of Brazil's Indians) immediately transforms from a white landscape into an exuberant green landscape, however, only for a short time. During this period the plants blossom, bursting into flower and bringing even more colour to the landscape. Although irrigation will allow agriculture in the "caatinga", a very deep water table makes such large investment unfeasible. Agriculture is restricted to cattle and goat breeding as well as the cultivation of a few vegetables such as corn, beans and manioc for local consumption. A variety of cactus is also grown without thorns, Opuntia sp. to feed the cattle through the drought. Lear's Macaws do not roost in the tops of trees like other macaw species, but shelter in the cavities of sandstone cliffs. At the end of the afternoon flocks arrive from different directions making considerable noise and fly over the sandstone cliffs until a place to roost has been found. 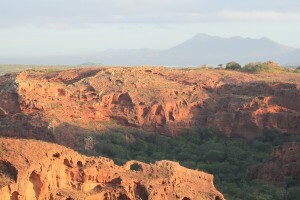 Traditionally two areas are used as roosting sites: Toca velha, (Old hole or cavern) property of the Foundation Biodiversitas, in the municipality of Canudos, (see pictures above) and the Serra Branca (White Mountain), a private property which is part of a farm with the same name in the Jeremoabo municipality. 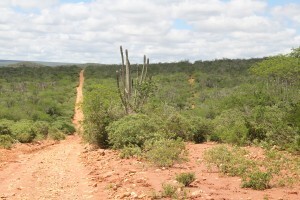 The Toca velha is a very dry area and its vegetation is typical of "caatinga" It has several sandstone cliffs, which are known locally as "sacos". During the breeding period pairs leave the group and start to live in nests located within cavities in the sandstone cliffs. At Toca Velha there is a field base with an infrastructure which allows the presence of biologists. This is very important because it allows studies to continue, involves the local population in the conservation work, and also helps deter illegal trapping. Serra Branca, however, is a more humid area, its vegetation is a little richer than the vegetation at Toca Velha and it is full of beautiful rocky formations. The concentration of Lear's Macaws in this area is more significant during the breeding period. The main diet of the Lear's Macaws is the fruits from the licuri palm tree Syagrus coronata. The palm nuts consumed by the macaws are easily recognised because they are opened by perfect transverse cuts. The Lear's Macaws also feed off other fruits found in the area such as pinhao (jatropha pohliana), umbu (Spondias tuberosa) and mucuma (Dioclea sp.) Sometimes the Lear's Macaws can be seen attacking corn plantations (Zea mays), which causes some concern to the biologists, since this kind of behaviour upsets the local farmers. During this study year the destruction of the licuri palm tree was 3% (average) of the total monitored trees, and the highest numbers were found in areas that had been burnt to make pasture. This causes concern since there are no licuri seedlings in the two traditional feeding areas used by the Lear's Macaws (Santa Ana and California farms). Many small seedlings are destroyed due to cattle stepping on them, and using them as food during the drought periods. This may lead to the elimination of the licuri groves, the principle food of the Lear's Macaws. 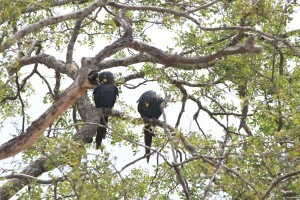 At present there are known to be 30 licuri palm tree groves from which the Lear's Macaws feed. These are formed by concentrations of licuri palm trees mixed with taller trees from where the Lear's Macaws can safely inspect their feeding area, which they do as follows. The flock perches together on a tall tree while two individuals fly to inspect the area. They then return and the whole flock flies to inspect the area and may or may not decide to abandon it. Therefore it is not enough to have just licuri palm trees to guarantee the survival of the Lear's Macaws. It is also necessary that these palm trees are situated in an area where high trees can also be found, otherwise the birds will not fly down to feed. 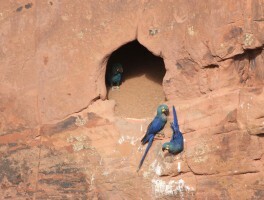 Most of the feeding areas of the Lear's Macaw are distributed among the municipalities of Canudos, Jeremoabo and Euclides da Cunha. 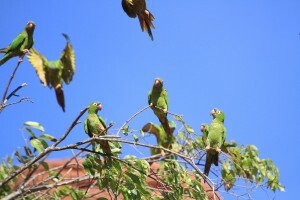 However, a group of Lear's Macaws are occasionally seen feeding in other areas, such as Santo Fe and Campo Formoso. The monitoring of the feeding areas is extremely important for the preservation of the species. Furthermore, it is most important that the "caatinga" is also preserved, as well as the licuri palm trees. The breeding season coincides with the beginning of the rains (end of the year) and extends up to May when the young start to leave the nest. 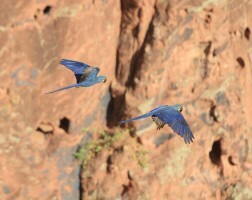 The Lear's Macaws make their nests in the cavities of the sandstone cliffs, which can be found at Toca Velha and Serra Branca. Little is known about the breeding habits of the Lear's Macaws. During studies made between 1997 and 1999 some information was collected. It was noticed that the birds that bred every year were not many and, although, some pairs may produce as many as 3 young birds, the average survival rate is only 2 birds per pair. These studies are important so that one can have an idea of how many young birds join the population each breeding season, which is a vital factor in determining if the population is growing or not. Since 1979 several censuses have been carried out to establish the total number of Lear's Macaws. The results varied between 50 and 200 individuals. However, recent simultaneous censuses have confirmed an average of 170 birds. It is also known that the Lear's Macaws move from their traditional roosting areas to more humid areas with these moves coinciding with the drought periods. 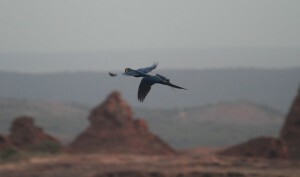 This may explain why Lear's Macaws can be found in other areas during very dry periods. The current situation has already been described above, but the report condemns unequivocally those who believe that holding birds threatened with extinction in captivity is a form of conservation. A possible exception may exist when a way can be found to release young bred in captivity successfully into the wild. It is planned that the Lear's Macaws presently held in captivity in Brazil will be bred and reintroduced into the wild. These birds have been installed by IBAMA temporarily at the Sao Paulo Zoo. However, projects are under way to transfer these birds to three specific breeding areas in Brazil. These areas will be chosen by using criteria such as climate, distance between areas, (so that natural catastrophes in one area do not effect the population in another area) logistics, infrastructure, costs etc. Besides this the breeding areas should be close to their natural vegetation "caatinga" so as to facilitate adaptation of the breeding pairs and the young to be released. Once the breeding stations have been constructed the Lear's Macaw pairs will be transferred for acclimatisation and breeding. The "caatinga" ecosystem of Brazil has never received the attention that it is due. The vegetation is often burnt for pasture and agriculture. 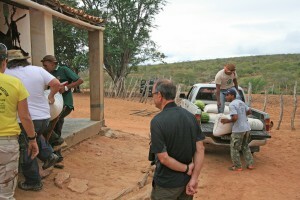 In the "caatinga" goat breeding is also a serious threat. Local farmers use the licuri fruits as a food supplement for cattle and goats in the winter. The ecosystem is fragile and if not protected can lead to devastation and desertification. The presence of the natural vegetation is indispensable in maintaining the delicate balance in the "caatinga", thus, guaranteeing food for the Lear's Macaws, and other species which depend on it for their survival. This will also ensure the survival of other species, which although more common are just as important, such as the White Bellied Nothura (Nothura boraguira), the Black Chested Buzzard Eagle (Geranoaetus melanoleucus), the Blue Crowned Conure (Aratinga acuticaudata), the Blue-fronted Amazon (Amazona aestiva); the Red Cowled Cardinal (Paroarila dominicana) among many others. Many factors threaten the survival of these birds, however, the majority are caused by humans. Therefore it is essential to study these factors and find solutions for each one of them. Since 1992 with the creation of the Special Working Group for the Preservation of the Lear's Macaw various projects have been planned. In 1997 the Committee for the Preservation of the Lear's Macaw, (Anodorhynchus leari) was formed. In 1999 this Committee was amalgamated with the Committee of Anodorhynchus hyacinthinus and was renamed "The Committee for the Recovery and Management of the Anodorhynchus leari Lear's Macaw and Anodorhynchus hyacinthinus Hyacinth Macaw", with the objective of continuing the work already started. In addition in 1997 the FNMA (Fundo Nacional do Meio Ambiente) donated funds, thus enabling various projects to be completed. However, much work remains to be done. It is necessary to maintain in the field one biologist, two trainees and an assistant, together with a means of getting around. This requires a four-wheel drive vehicle, e.g. Toyota and includes maintenance and spare parts. Besides this basic infrastructure various priorities should be established in order to carry out the field study. The monthly census not only establishes the number of birds in the wild, but also at which times of the year they can be found at their roosting sites. The census is also important for comparison of statistics with other censuses made simultaneously in other areas in order to monitor population movements. During 1998 monthly censuses were made which were important in establishing the average number of birds in the area. However, this work should be improved upon. In the Serra Branca, for example, the observer at the foot of the cliffs has a restricted view. ideally the census should be done from the top of the cliffs where there is a better view and, therefore, less chance of errors. The exploration of the region takes time and depends on how long the field group can stay in the area. The definition of these areas is essential for conservation planning. The monitoring of daily movements is most important in establishing the distance and number of feeding areas in relation to the roosting sites. The monitoring of seasonal movements determines the routes used by the Lear's Macaws in accordance with the time of year. This is vital in establishing all the areas used by the Lear's Macaws throughout the year and the existence or not of new populations (for example are birds seen in other areas from known areas or could they be a new population?). This work depends on getting to know the region well, accompanying the birds and the efforts of the field group. The base camp mentioned above would be used for this. in addition another four-wheel drive vehicle would be necessary. This is of fundamental importance. Not only will it confirm the breeding behaviour of these birds, but also indicates how many pairs, in which areas, and at what time of year they are breeding and the success rate. Knowing how many young survive from each nest is also essential in determining how many new birds enter the population each year. With this, and knowing how many birds leave the population each year, one can determine if numbers are increasing, decreasing or are stable. The monitoring of the nests on a full time basis also helps to discourage illegal trapping. This was done at Toca Velha during 1998 and at the beginning of 1999. However, it is essential that this work continues and is also implemented at Branca where there are a larger number of breeding birds. Again the base Serra Branca would be used for this involving a a biologist and assistant so work can be done simultaneously at Toca Velha and Serra Branca. This involves the registration of new groves and the monitoring of the densities of trees within these groves. The phenology studies include the time of year the tree flowers and bears fruits, productivity and survival rates. These details establishes where the licuri groves can be found, how many there are, how many are productive, the causes of death, and other factors which influence the flowering etc. Studying the biology of the licuri palm tree, whose fruit is the basic diet of the Lear's Macaw maintaining a permanent group working in the field will help to encourage local human populations to preserve the licuri groves on their farms. Apart from the basic infrastructure aerial photographs and satellite images will be required to monitor licuri plantations. Since the licuri palm tree is the basic food of the Lear's Macaw and knowing that trees are not replaced, it is essential that the palm's long term survival is guaranteed. 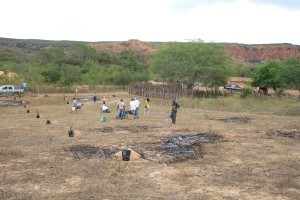 On the Santa Ana Farm 600 licuri seedlings, donated by Faunacao Biobrasil, have been planted. However, these seedlings are still very small and depend on irrigation for survival. It is also important to monitor the success rate of this plantation, so it may be extended to other feeding areas. Funding will be needed to set up a nursery for seedlings, construct an artesian well with gasoline pump as well as for personnel and power for the pump. One of the most serious problems of not only the Lear's Macaws, but all macaws is illegal trapping. Many birds have already been trapped and sold to bird collectors around the world. This has led to the drastic reduction of numbers and the extinction of some species in the wild such as the Spix's Macaw (Cyanopsitta spixii).This is very serious, but as with all black markets very difficult to control, however the problem can be reduced by monitoring the breeding areas, involving local communities with the conservation work and maintaining a field group in the field. Apart from the basic infrastructure radio communication between the bases Velha and Serra Branca and Canudos will be necessary to facilitate contact with the police. The sub-projects may appear ambitious and expensive at first impression, but closer reading shows that as they are interrelated and the same infrastructure can be used for most of them. What must be realised by many aviculturists is that very rare species such as the Lear's Macaws cannot be conserved effectively by taking them from the wild and attempting to breed them in captivity in another hemisphere. Even if breeding there is successful in producing strong healthy birds, they cannot just be released into what will be for them an alien environment on the other side of the planet with different seasons. Breeding in captivity must occur in or very near to the known or accepted distribution area. This breeding must also be part of a long-term ongoing properly managed and controlled scientific project. I believe the major contribution aviculture in Europe and North America has to make is in the form of an expertise and know-how transfer of husbandry and breeding techniques/skills - not livestock. The Lear's Macaw was hot news at the time of this article with the trial in 1990 of Harry Sissen from the UK, for the illegal importation of three Lear's Macaws. If it is true that Lear's Macaws are available on the black market for £50,000 a pair, then these three may have cost in excess of £75,000, which would have gone a very long way to defraying the costs of the important conservation work detailed above. This is aside from the fact that the macaws are caught by dropping nets down the cliff face so that the macaws are caught up when they emerge in the pre-dawn gloom. The nets are then drawn up usually injuring the birds. Thus to obtain one intact pair for illegal trade several other macaws will probably die from stress, physical injury or both. The measures proposed in this little booklet by the Committee for the Recovery and Management of the Lear's Macaw deserve our full support. "For in the end, we conserve only what we love, we love only what we understand and we understand only what we have been taught" (Baba Dioum - African environmentalist). Since Tony's initial comprehensive report above, considerable progress has been in the conservation of Lear's Macaws in their native habitat, by other groups such as the Environmental Conservation Organisation (ECO), the Lymington Foundation, and Biodiversitas. Nesting sites are monitored, populations counted, and illegal trapping has been reduced. Licuri palm nurseries have been established, and artesian wells dug for irrigation. A major problem has been the raiding of the local subsistence farmers' crops of maize by hungry Lear's macaws when there are no local supplies of palm nuts. The ECO group, led by Kilma Manso, has established a successful policy of short-term compensation of such farmers by supplying them with sacks of corn, while longer term objective is to educate the farmers about the ecological value of these endangered parrots and the re-planting of Licuri palms and other native trees. 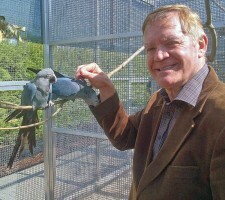 This scheme has been part-financed by Parrot Society Conservation Fund donations for several years now. 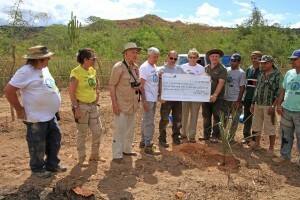 In 2016 a group of PSUK members and officials was lucky enough to visit north-eastern Brazil to see this conservation work at first hand, and to present a cheque for £2,500 in ongoing support. Please forward by post or by E-Mail to The Parrot Society UK for the attention of The Webmaster. We review all submitted articles and the society reserve the right not to publish articles at their discretion. Their decision is final in all these matters and no further correspondence will be entered into.